This stunning modern home and landscaped garden with pond provides a unique and private setting located at the foot of Minnewaska State Park. 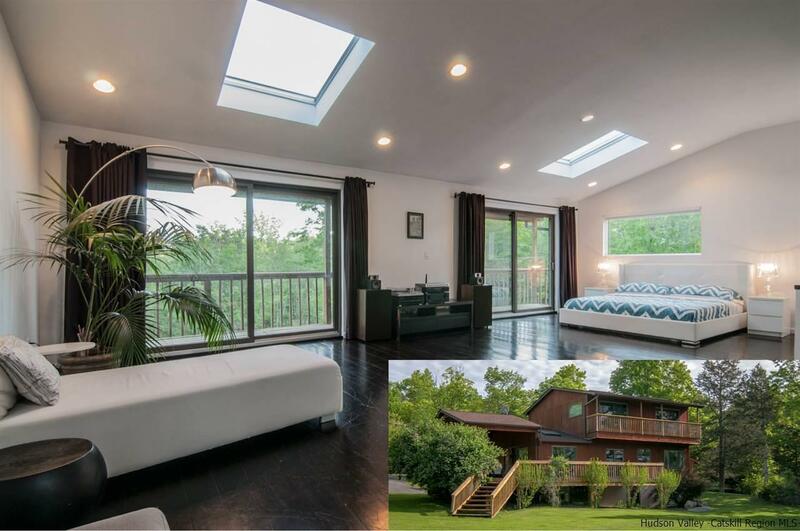 *Time on the market is a result of lack of access due to extremely busy Airbnb Rental history* This contemporary 3 bed, 3 bath home has been extensively renovated with a lofty, open floor plan. It features artful elements such as a stainless steel modern kitchen, sleek and luxurious modern bathrooms, pellet furnace, skylights that accentuate the bright, lofty feel, and sliding doors and windows that capture the serene beauty of the natural landscape this extraordinary parcel provides. The 2.5 acre woodland property features privacy and placidity with a pond and waterfall accompanied by a landscaped garden. If desired, add another property on one of the two buildable lots, with frontage on Sheldon and one already BOH approved totaling 10+ acres. On the market listed as 107 & 113 Sheldon Rd. Located in the hamlet of Pine Bush, the property provides close proximity access to wildlife sanctuaries, world class climbing in and around the Awosting & Mohonk Preserves. Surrounded by local farms and the Shawangunk Wine Trail. Nearby the renowned Mohonk Mountain House, Historic Huguenot Street with local eateries and galleries. This retreat is situated with easy access to Stewart International Airport (35 min), I-87 (25 min), and I-84 (25 min) providing easy access to New York City or the greater northeast.